How Avatar would look with and without CGI. CGI works wonders! :P. Wallpaper and background images in the Avatar club tagged: avatar 2009 film cgi with without. Thanks for the shot. 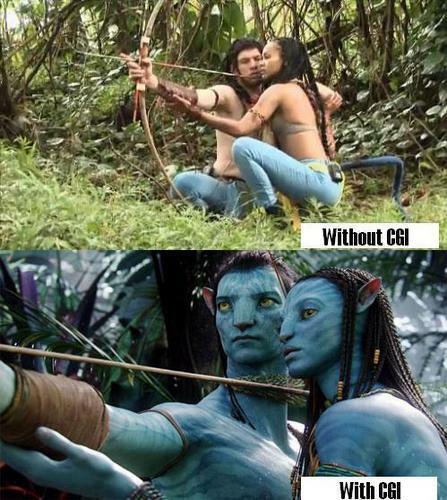 Just shows how incredible the CGI is in Avatar. CGI has come a long way since The Polar Express. Wow so they did shoot outdoors. I just figured it was all done on a large soundstage and green-screened the graphics in after. Actually OceanCoast, they practiced the scenes in the jungle, but they actually shot it in a greenroom.